Salzburg might not be at the top of your list of places to visit on your next European vacation, but it should be. If you're travelling through Austria, it's worth stopping over for a day or two to see what this fantastic city has to offer. The best way to spend 24 hours in Salzburg is to get here early in the morning, hopefully by an overnight train from your last destination. This way, you'll save yourself one nights accommodation and can splurge a bit the next day. 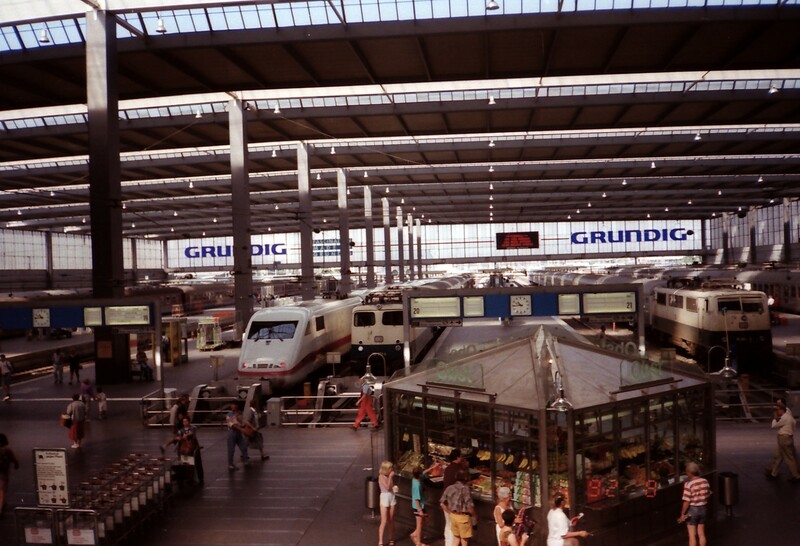 Overnight trains in Europe are excellent and are an experience everyone should have once in their life. After stepping off the train, your first stop should be at a local cafe. This doesn't have to be anywhere fancy or famous. Train stations in Europe have marvellous cafes open as early as the trains start arriving where you'll be able to sample all the delicacies that Austria has to offer. Often, when merely transferring trains in a country I might not have visited, I will spend my time waiting for my connection sampling local treats. I've had legendary Belgians waffles in the Belgium without ever stepping foot outside the station. Salzburg is most notable for their "Nockerln", a cream-and-butter fluffy souffle served with a fruit sauce. So if you want to start your day off with a particularly Salzburgian flare, see if you can find one of these. After grabbing a few pastries and coffee to get you started, head down to Mirabell Gardens. Here, you'll be able to sit and enjoy your Austrian breakfast in one of the most elegantly designed royal gardens in Europe. The gates of the park open at 8 am so be sure not to arrive before then. Mirabell Gardens is a serene oasis that long has been the secret gateway for the Austrian aristocracy. The Palace that served as the backdrop for gardens was built in 1606 for Prince-Archbishop Wolf Dietrich von Raitenau. He had the heavenly white mansion designed for the love of his life, Salome. The prince ensured that the gardens were as impressive as the interiors since Salome adored being in the outdoors. In 1721, after a fire destroyed much for the buildings, Prince-Archbishop Franz Anton von Harrach had it redesigned by the famous Baroque architect, Lukas von Hildebrandt who integrated all the various structures that were spread out into one self-contained complex. This allowed the gardens to surround the palace and flow alongside it like a river, so that no matter where you exited, you were always greeted with lush greenery and brightly coloured flowers. The Mirabell Gardens are truly a preserved treasure of a bygone age. The Hedge Theater, created between 1704 and 1718, is one of the oldest hedge theatres in the northern Alps and is the same hedge theatre used in the film The Sound of Music. The Von Trapp children can be seen running through it during the “Doe A Deer” musical number. Another ancient oddity that still lingers within this garden is the Zwergerlgarten or "dwarf garden". This small alcove is located just up the stairs from Pegasus statue. Most visitors pass right by it, but make sure you make a point to explore. Within this petite corner is a collection of exquisite, yet grotesque, figures of dwarves modelled after actual people who lived in the palace in the 17th century. Back then, it was thought to be good luck to employ a dwarf. The Archbishops of Salzburg adored them so much that he even has their likeness cast into stone. Nowadays we might look at these statues and feel like they are slightly offensive, but at the time they were meant to be an honour and were revered by all those who passed by them. The original landscape designer went to great lengths to create a sumptuous structure for the garden beds which could be seen not only from the palace but the top of the hillside Fortress. This way, all those around Salzburg could see the greatness that was Mirabell Palace Gardens. The gardens are always changing up their flower designs and colours for guests and locals alike, so there's consistently something new to discover. As you circle the perimeter, you’ll notice towering white statues which act as the guardians of the garden. Sculpted by Gerard van Opstal, a skilled artist of classical mythologies from Antwerp, these glorious scenes of lust, triumph and pain, while not as proficient as some pieces coming from Italy’s Renaissance masters, are nonetheless wonderfully powerful works of art. As you finish up with your tour of the Gardens, pass through the Northern Exit which will lead you out towards the Salzach River. Walk south-east along the river's edge where you'll find a pretty pedestrian walkway. This little trail is a great place to admire the cake-topper, pastel baroque houses which dot the riverside. Soon, you'll reach the Mozartsteg bridge, a great place to stop and watch tourist boats putter by, much as the salt boats would have floated up and down this same river hundreds of years ago. Salzburg's mines were rich with salt, a hot commodity as early as the 8th century. Salt is the reason the city became wealthy, and as such, gave the town its name. Salzburg means "Salt Castle". After you get off the bridge, head down to the Mozartplatz or Mozart Square. Mozart Square is named after Salzburg's most famous resident, you guessed it, Wolfgang Amadeus Mozart. The statue looming in the middle of the square, dedicated to the legendary composer, was unveiled on September 5, 1842, by sculptor Ludwig Schwanthaler. Although Mozart wasn't alive to see it, his sons were present as the entire city came together to honour their father's work. The buildings surrounding Mozartplatz are lovely examples of 16th and 18th-century architecture so take a minute to sit and admire the surroundings. Residence Square is located nearby and is made up of the New Residence of the Princes of the Salzburg, the Salzburg Cathedral, various aristocratic townhouses and a dozen famous bakeries and cafes. In the middle of the square stands the centrepiece, the enormous Italian Baroque fountain of Tommaso di Garone. It is one of the most magnificent baroque fonts in Europe. Four horses burst out of a rocky mound, rearing up their legs as water shoots from their mouths. Triton stands upon the rocks, holding up a scalloped upper basin which three dolphins balance atop. While exploring Residence Square check out the Royal Residence courtyard. Although you can explore the interior as well, this might be better left for a more extended stay. From the exterior, you can still see where the Royals would have lived during their time in Salzburg and get a glimpse of their lifestyle in Austria. Next, it's over the famous Dom zu Salzburg or Salzburg Cathedral for some spiritual awakening and awe-inspiring architecture. The first Christian church was built in here Salzburg in 774. The original foundations of that church remain here today, underneath the new DOM. When that first church was built, it was one of the largest sacred buildings in Europe. But in 842, it was struck by lightning and burned to the ground. In 1181 a late Romanesque structure was restored but was also burnt down in 1598. Some say the fire wasn't an accident but were initiated by the then Prince Archbishop, Wolf Dietrich who wanted to have a new church built in his preferred style. But his plans were thwarted, and Italian architect Santino Solari oversaw the current design. It was consecrated in 1628 by Archbishop Paris Count Lodron. The Salzburg Cathedral is one of the best examples of early Baroque architecture in Germany. Its imposing Untersberg marble facade is framed between two twin towers topped with bright green domes. Atop the towers are four statues; Peter and Paul hold a key and a sword respectively and Salzburg’s two patron saints, Rupert and Virgil, each clasp a salt vessel (the symbol of the city) and a model of the church. The exterior of the church has a huge bronze statue of the Virgin Mary which stands outside to greet visitors. She is flanked by various other different expressive characters and her loving embrace to her son warms your soul on even the coldest day. There are three doors which allow you to enter into the church, each one illustrating a theme; Faith, Hope and Love. The interior of the church is both minimal and elaborate at the same time. The structure of the church is painted a soothing and peaceful shade of white. Despite the simplistic white paint, there are ornate stucco designs in baroque shapes embedded onto the walls, columns, archways and ceiling. Along the roof, we have brightly painted frescos, their colours sharply contrasted against the white of the rest of the Cathedral. Near the entrance, there is a Romanesque font where Mozart himself was baptized. The font is made entirely of bronze and decorated with reliefs of various biblical saints. Be sure to take a moment to study the magnificent organ. Many of Mozart's compositions were written for this very instrument and were initially meant to be played in this very place. Now, after all this walking I bet you're getting a little bit hungry. So it's time to start searching out something to eat. Walk over to the Alter Markt where you have various options. During the middle ages, farmers from all over the country would come here to sell their goods. The St. Florian Fountain in the middle of the square was built in 1488, with the Salzburg's coat arms emblazed on it. The buildings which surround the marketplace date back the middles ages, designed in the old burgher's style of architecture. There are many different cafes to grab a bite around here but if you have a few extra euros to spend and want an exceptional experience try the Café Tomaselli. This cafe is over a hundred years old and Mozart used to come in here to drink, of all things, almond milk. The cafe is full of history and is decorated with old painting curated by their various owners. The stories this place could tell if only the walls could talk. But this atmosphere comes with a price. If you still want a chance to visit but are short on cash, simply order a coffee and split a simple pastry with a friend. If you decide that the Alter Market is a little too rich for your blood head over to Fisch-Krieg Fish Market. This adorable restaurant along the water is half fish market, half restaurant. All you need to do is pick which variety of fish you'd like, choose how you want it cooked (grilled or fried) and they will serve it up to you alongside one of their many traditional Austrian salads. All their dishes are very reasonably priced and a great taste of traditional Salzburg cuisine. The interior of the shop with its unique plastic tree growing right up through the floor is one of those unforgettable touches that will stay in your memory forever. I cannot recommend this place more! Lastly, if you're looking for something really really inexpensive that's just as delicious as it is authentically Austrian, you have to check out the Balkan Grill. Balkan Grill is located at 33 Getreidegasse, in one of the most upscale neighbourhoods in the city. They have been serving up sausages in this tiny booth for over 50 years and there is always a line-up. They only have one thing on the menu: a grilled pork sausage, covered in your choice of; onions, fresh parsley, and a secret blend of spices served on a white bun with some curry mustard and ketchup. There is something about the fresh parsley that really brightens up the greasy sausage. Once you have sated your hunger take a few moment to explore Getreidegasse. Getreidegasse, or "grain lane", is the most prestigious shopping street in Salzburg. It's most recognisable for its tall and narrow houses which seem to lean over the sidewalk below. Ornately designed wrought iron signs hang off the sides of the buildings. In the middle ages, these signs were wordless symbols to help the citizen who couldn't read find the bakeries, cobblers or butcher shops. Now the signs have been updated with logos featuring iconic fashion brands, but they have still kept up their antique look. One building worth a second look is #9 Getreidegasse. This is Mozart's "Geburtshaus" or Birthplace. Its golden yellow exterior makes it unmissable as you walk along the street. The Mozart Family lived on the third floor of the "Hagenauer House" from 1747 to 1773. Mozart spent his childhood in Salzburg right here, developing his incredible musical talent. Inside is a small museum which still holds many objects from the Mozart household and recreations of what the home would have looked like in the 18th century. Once you're finished exploring Getreidegasse, head north, down Wiener-Philharmoniker-Gasse to see the Franciscan Church. The Franciscan Church or Franziskanerkirche is the architectural opposite of the Salzburg DOM. Whereas the DOM is bright and white, the Franziskanerkirche is dark and GOTHIC! I love both for different reasons, and both are worth checking out. The first church built on these grounds was erected in the 8th century. It was frequently ravaged by fires and rebuilt time after time. The Salzburg middle class of the 15th century were reasonably well off, and when their church needed renovation, they gathered up the required funds themselves and hired the famous architect Hans von Burghausen to design a newer and more magnificent church. His work was a masterpiece of Gothic architecture. Throughout the church, you'll find slender, dark marble columns which reach up to the sky and open up into refined rib vaulting. Like a pair of hands, whose fingers open to the heavens. Continue onwards to St. Peter's Cemetery. St. Peter's Cemetery is the oldest cemetery in Salzburg. Looking at the gravestones, they don't appear to be so ancient but take a look behind the headstones, along the rockface, to see where the real history lies. Carved into Mönchsberg are a set of caves which served as catacombs for the earliest settlers. The oldest surviving tombstones inside date back to 1288. If you decided to go inside, you can climb up the 48 steps to see the “Gertrauden Chapel” which dates back to 1178. Back on the ground, you can see several crypts which flank the exterior of the nearby church. These elegant wrought-iron fences protect the crypts of some of Salzburg's wealthiest families. These crypts also were the setting for one of the iconic scenes in The Sound of Music when the Von Trapp family was hiding from the Nazis during their daring escape. To end off your walking tour, head over to the Mönchsberg funicular which will take you all the way to the top of the hillside to the crowning glory of Salzburg; the Hohensalzburg Castle. The first castle built on this site was raised in 1077 and was little more than four wooden walls. It was made high up on the hills to serve as a lookout post to protect the city against Imperial troops from the Holy Roman Empire. Over the years, towers were built, and stone walls were added to fortify the castle, and the fortress grew in size. Inside the castle, the first room you'll pass through is the portrait gallery. It's filled with more than a dozen portraits of all the Prince's whose legacy it was to grow this size and strength of this impressive Castle Fortress. 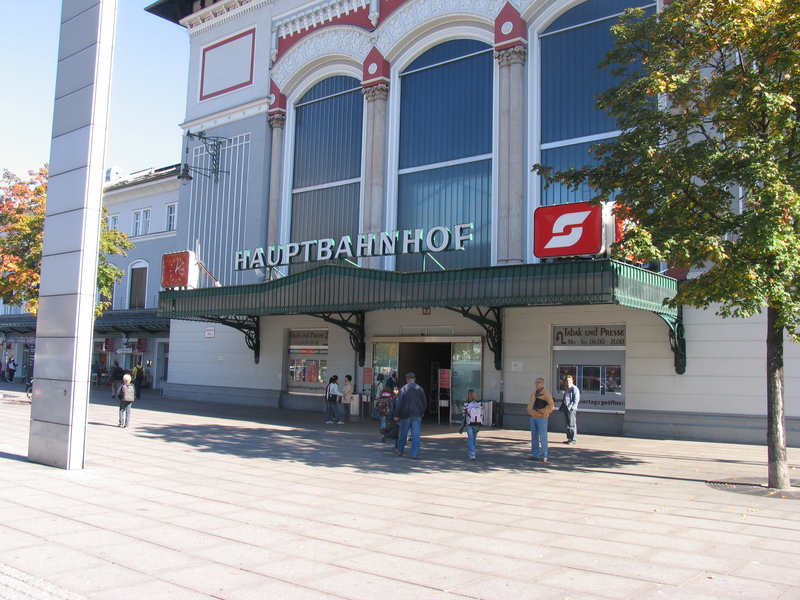 Unlike many others across Europe, this building has not be touched by modernization. Salzburg was never subject to attack so its historic castle was never destroyed or rebuilt. This treasure of the past is truly a unique experience to walk through. Inside you'll get to see some of the furnishings that were used by the royals who once lived within these walls. Opulent wallpaper, lush bedding and even the most ornate heaters you've ever seen. In addition to exploring the life of the royals, there are also various exhibits displaying the might of their army. Armor, weaponry and even medieval torture devices are on display for viewers to discover. After exploring the castle, take advantage of the vantage point atop the mountain and walk along the pedestrian path towards the perfect dinner destination. As day turns to dusk, you'll have a wonderful view of all the lights of the city as you make your way towards the Austinger Brau. 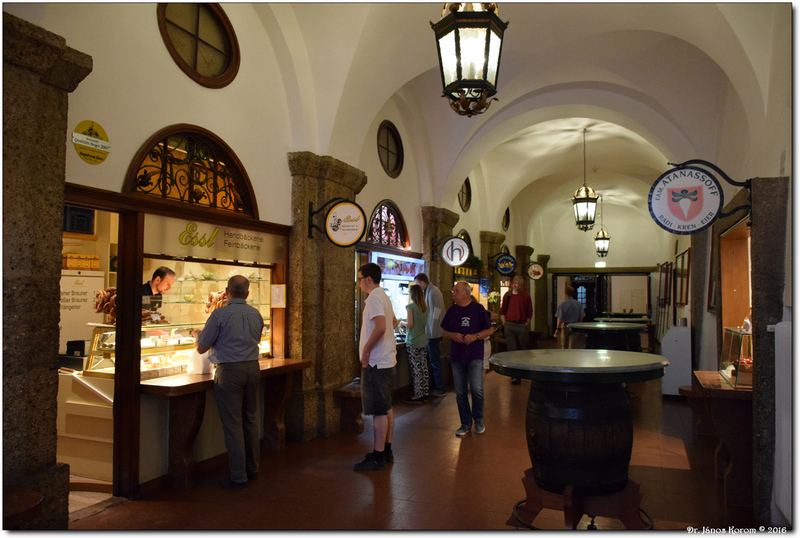 The Augustiner-Bräu is an old beer hall frequented by locals and tourists alike. If you arrived on a colder night, don't be surprised if you walk in and think it's closed (that's just because all the action is happening downstairs as the beer garden is only open in the warmer months). Head down the stairs and turn the corner. Any silence you might have experience upstairs will be broken by the sounds of laughter and the occasional singing accompanied by the smell of cooking sausages and freshly poured beer. This place is indeed the ideal location to finish your day exploring Salzburg! If you're lucky and the beer garden will be open and you'll enjoy your food and drink beneath a canopy of ancient Austrian trees under the starry sky. But first, you'll need to know how to serve yourself. Yes, that's right. There are no waiters here. To get a beer, first go to the register and pay for as many drinks as you'd like to have, they will give you one ticket which you use to trade in for a stein and another for your beers. Once armed with your stein, hand the barman your drink ticket to fill er' up! The trade for doing all this yourself? Cheap beer which tastes great. Once you're done drinking as much as you can, wash out your stein and place it on the rack for someone else to use. The food available is traditional Bavarian fair. Small vendor stalls are located in the basement. They have everything from appetizers to desserts. Perfect for whatever you're craving! Once you've got your tray of food and beer find and table and make some new friends. We witnessed friendly Austrians singing happy birthday to a group of tourists to welcome them into the country. No doubt this tour has worn you out, but after a few Austrian beers, all you'll feel is that warm fuzziness that comes from good friends and a beautiful day in a fantastic city.